True Colors by Natalie Kinsey-Warnock. Review: Have you ever felt like something's missing in your life? In the book True Colors by Natalie Kinsey-Warnock, Blue is taken care of by a old woman named Hannah. Blue doesn't have a mother and is trying to figure out who her mother is, and why she left Blue with Hannah. The mystery of Blue's birth mother will be solved along with many other mysteries. Blue is a young 11-year-old girl who lives on a small farm town in Vermont. Even though Blue loves living with Hannah, she still has always wanted to meet her real mother. She tries to get answers to the questions that she has about her mom, but instead she discovers many clues that she doesn't understand at first. But after a disastrous event caused by two troublemakers, everything begins to make sense. 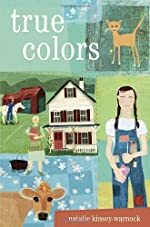 True Colors is a book that I would recommend for girls in 5th grade to 6th grade. I liked this story for a few reasons. First, because the story is very suspenseful. For example throughout the story I wondered why Blue's mother left her. Secondly, I really liked the main character Blue because she is caring and sneaky at the same time. An example of her sneakiness is when Blue gets a job just to try to learn more information about her mom. Lastly, I liked the setting because it takes place on a farm; I liked that because most books I've read are set in places like cities. I really liked this book and was always looking forward to getting back to reading it. I highly recommend True Colors. Review written by (th grade student). We would like to thank Random House for providing a copy of True Colors for this review. Have you read True Colors? How would you rate it?